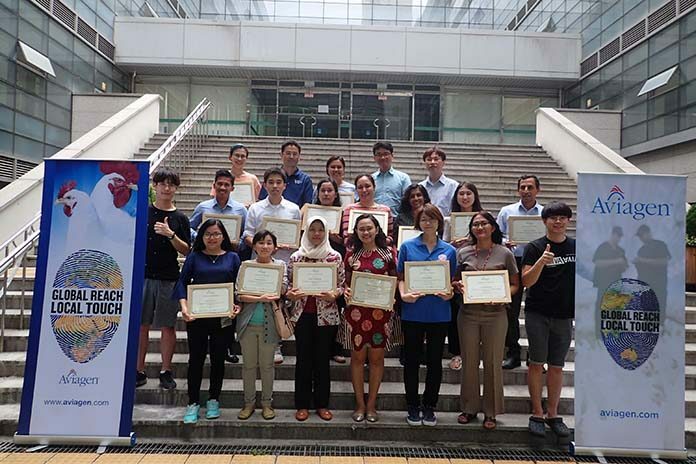 In line with its commitment to bird health and welfare and food safety, Aviagen® Asia hosted a beneficial workshop on the detection and prevention of Salmonella and Mycoplasma. The workshop represented the first practical training in the Republic of Korea to provide scientific information and lab techniques for avian Mycoplasmas and Salmonellas. Taking place Aug. 21-23 at the College of Veterinary Medicine of Konkuk University in Seoul, Korea. The workshop welcomed 15 valued Aviagen customers from 15 different companies representing 9 countries throughout Asia during. The sessions combined theory with hands-on learning, and were led by Aviagen veterinarians, as well as leading experts from academia and the industry. Aviagen has been proactive in helping companies set up laboratories and laboratory testing procedure, and in running workshops, especially for customers who work in or oversee laboratories. This workshop offered up-to-date lab training on various types of PCRs, serology and conventional bacteriology on Mycoplasma and Salmonella. “At Aviagen, we’re devoted to our customers and the success of their businesses. To show our dedication, we offer quality broiler breeding stock, as well as the latest knowledge and practices to safeguard the health of their flocks, so that together we can supply current and future generations with a safe, healthy and sustainable source of protein,” added Regional Veterinarian Dr. Keat Fu. “This successful workshop received positive feedback and requests for future similar trainings for Asian customers. Aviagen Asia is a learning organization, committed to continuous improvement, and we will use the input and lessons learned from this workshop to improve the quality of our future offerings,” explained Aviagen Regional Veterinarian, Dr Youngho Hong. Attendees benefited from the opportunity to network with their industry colleagues, sharing challenges and exchanging ideas and on operations within the laboratory. “The workshop was great, offering much knowledge from experienced and enthusiastic presenters,” said Hiyori Kinoshita of Nippon Chunky, Japan. “The training thoroughly covered all aspects of salmonella and mycoplasma diagnostics. It was great to learn from such knowledgeable experts,” stated Dr. Neha Giridhar Shrikhande, Indian Broiler Group, India.